About 5 miles from the Monocacy's confluence with the Potomac is Sugarloaf Mountain, a 3,000-acre, privately owned preserve that is open to the public. 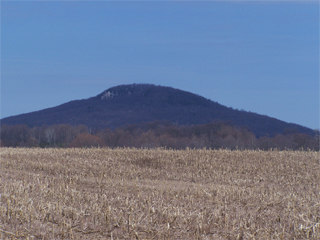 The mountain stands out among the rolling hills of the Maryland Piedmont, reaching 1,280 feet above sea level. Geologists say that internal pressures forced the mountain upward, and it eroded to its present height. For many years the mountain was owned by Gordon Strong, who established a foundation, called Stronghold, Inc., which administers the mountain programs. Sugarloaf Mountain has panoramic views of the Monocacy and Potomac valleys. Several excellent hiking trails are available. The 2.5-mile Mountain Loop Trail (white blazes) makes a loop around the summit of the mountain and can be combined with other trails to make a longer hike. The Saddleback Horse Trail (yellow blazes) is a seven-mile trek around the base of the mountain, open to hikers, mountain bikers, and equestrians. For more information and a trail map, select this link.